Upper filter replacement filter for all Hottop models. Manufacturer suggests replacement at approximate 6 month intervals based on average roasting volume. 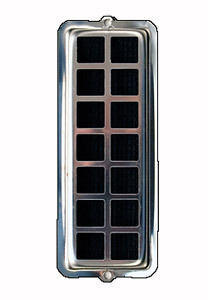 Made of stainless steel, the underside of the filter, shown below, has a charcoal filter. Exhaust from the roaster exits from through this filter, however, the air flow is not under pressure.